In the interest of trying to swiftly move forward into 2018 so that I can blog about fresh new music (and non-music stuff), I’ve decided to condense and compile a handful of my remaining album reviews from 2017 down to a few blurbs. Part II coming shortly! There are two full reviews I’d like to knock out after this, and then I’ll follow up with my annual year-end awards later. Despite enjoying Blood of the Nations and Stalingrad being a decent follow-up, I ended up skipping Blind Rage as I felt the band was taking a heavier, harsher direction that wasn’t enjoyable to my ears. However, the band’s fourth effort with former T.T. Quick vocalist Mark Tornillo is a winner. The album is heavy, but it seems like there more of an emphasis on melody and the band has opted for a more straight-forward and traditional heavy metal style that draws influences from the likes of Motorhead or AC/DC and the songs are catchy this time around! In other words, The Rise of Chaos sounds more like classic Accept. And, whether intentional or not, Tornillo is sounding more and more like former Accept vocalist Udo Dirkschneider. Random side-note: “Hole in the Head” sounds like a ’90s Megadeth song. In 2015, I was new to the band and blown away by Stormborn, when it was released that same year. I anxiously awaited the next release. Unfortunately, War of Dragons is not a standout album by any measure. It’s a generic slab of European power metal, keyboards and all. Sure, Stormborn was European power metal as well, but it was heavy and truly powerful. Most of what fits the modern label of “power metal” these days lacks balls and bite and the same can be said of this release. Even when I thought the band was going to deliver the heavy metal goods on “King of Swords”, they cut to the typical soaring Euro power metal chorus and galloping drums that completely ruin the song. Don’t be fooled by the amazingly heavy metal album cover– Bloodbound has retreated into wimpy power metal mediocrity with War of Dragons. What a shame. I’m fairly confident this band is never going to be able to match Permission to Land or One Way Ticket to Hell… and Back, they simply lost too much time and momentum, but The Darkness is still a fun, quirky band and they still write great vintage hard rock riffs inspired by the likes of AC/DC and Thin Lizzy with an interesting mix of pop. Ugly cover art aside, Pinewood Smile is a satisfying release that I would at least put on par with their previous effort, Last of Our Kind. Of course, the lyric and situations being described by the lyrics are still usually quite silly and they don’t always make sense to my American ears, but the music is so good that it doesn’t matter. I’m very casual Deep Purple fan. They have some classic tracks and albums, but I’ve never been particularly devoted to them, nor do I own the majority of their catalog. I suppose if I grew up during the heyday I’d have a greater appreciation for that band and their modern releases. That said, I do enjoy the “Deep Purple sound”. When you hear Deep Purple, you KNOW it’s Deep Purple, and that’s exactly what Infinite is– Deep Purple. Inifinite is perhaps a bit laid back and a little mellow with a spaced-out track such as “The Surprising”, but that’s pretty much to expected from a bunch of guys in their late 60s and early 70s. I know not to expect In Rock or Machine Head from these guys. Even so, the band still can crank out a solid heavy rocker or two, and Ian Gillan sounds good even though he is now 72 years old! Yeah, you’re not going to get a “Child In Time”-style screeching performance out of him anymore, but his voice is still fantastic. This is a fine album, but I can’t say it’ll stick around in my brain or playlist for much longer. What a brutal album cover that totally screams “heavy metal”. I picked this one up on vinyl in great condition for only $1 at a local flea market annex shop called Fort Walton Beach Vintage Records. 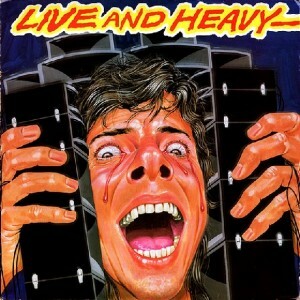 Live and Heavy is a compilation put out by the British label NEMS that, unsurprisingly, features live tracks by UK rock bands. Had this been released a year or two later, I’m sure it would’ve been full of NWOBHM bands but instead we get bands that are more closely associated with ’70s hard rock and heavy metal. This compilation has a killer line-up: Gillan-era Deep Purple, Rainbow, Whitesnake, UFO (“Lights Out” is titled “Lights Out in London” on this release), Ozzy-era Black Sabbath, Motorhead… some of the very best heavy rock bands England has to offer. Even Def Leppard makes an appearance. Pretty good deal for such a new and young band (at the time) to get a track compiled with a number of other legendary bands. Had this been a compilation of studio tracks, I probably would’ve passed. I’m not big on live album but for a collection of live cuts from these specific bands, I figured it was worth a buck. The inner sleeve lists the various dates and venues these tracks were recorded. Always good to have that info. I was afraid this was going to be a super low-budget compilation that wouldn’t even bother. This is a good pick-up for fans of hard rock from the 1970s and early 1980s. 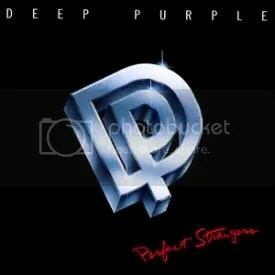 Years ago, during a Columbia House or BMG Music binge, I ordered Deep Purple’s Perfect Strangers and then I never bothered with another Purple album. I wasn’t overly impressed by the album at the time and I’ve always had this hang-up on Deep Purple that they were “too 70s” and too heavy on keyboards and organs and that’s just not my style of rock. 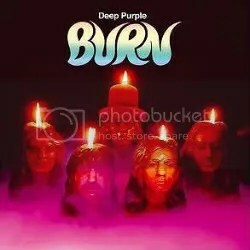 Well, years later I decided to give the band a chance again by picking up Burn featuring the Deep Purple debut of two of my favorite rock vocalists – David Coverdale and Glenn Hughes. It didn’t hurt that I found this anniversary edition online, brand new, for only six bucks and some change. Again, everything about this album screams 1970s. The keyboards, the album cover, the funky & bluesy bass lines. I should really hate this album but somehow, I like it. I don’t love it, but I like it a lot and its a real treat listening to Coverdale and Hughes share lead vocals. Coverdale didn’t play any instruments in the band, so I’ve always wondered how he felt about sharing vocals with a band member who is playing an instrument as well. Just seems like a weird deal to me, but it was the 70s after all! This album began the end of Ritchie Blackmore’s involvement in the band he co-found as he hated the bluesy and funky direction Hughes and Coverdale were taking the group in. I will say this, this album features some GREAT performances by Coverdale. Just listen to “Mistreated”. The remixes I guess are nice if you have a really good ear or sound system for that type of stuff. I don’t have either, but I appreciate the effort put into this package to make it something special. “Coronarias Redig” was a B-side and is a pretty cool funky jam. There’s a very comprehensive booklet as well that’s full pictures and talks about the history about the band during this time frame. I love it when reissues include retrospectives like that. It oughta be a law. I bought this album close to 10 years ago basically just for “Knocking at Your Back Door”. I ended up liking “Perfect Strangers” as well, but quickly disregarded the rest of the album. It was nothing more to me than bad 70s keyboard/organ heavy rock. That was then, this is now and this album rocks! I’ve become much more easy going when it comes to 70s hard rock/metal acts like Rainbow, Black Sabbath and Deep Purple (all three of these bands kinda ran in the same circles, didn’t they). After initially passing this album off as an oddity for something released during the 80s, I can now appreciate the “classic” sound Deep Purple brought to this comeback release. In striving to to match their “classic” sound, Deep Purple ended up putting out something in 1984 that didn’t really sound like anything else going on at the time and as much as I love the 80s, that’s really cool of them and it payed off in a big way. This would be the popular “Mark II” line up of the band making the comeback. Deep Purple hadn’t released an album since 1975 and the Mark II grouping hadn’t released one since 1973. The reunion was a success with the album reaching #6 on the Billboard charts and the subsequent tour selling out. The album went on to go platinum in the States and double platinum in the UK. The 1999 remastered version features the instrumental bonus track “Son of Alerik” which previously had only been released as a B-side to the “Perfect Strangers” single.